Why are some parts of the world poor today, while others are rich? At which point in time did they diverge, and what were the reasons? These core questions are addressed in a concise and accessible introduction to global economic development since 1500. Leading economic historians from across the globe provide overviews of major world regions together with global comparison chapters and case studies highlighting key themes, individuals, processes and events. Utilising a set of common developmental indicators, the chapters address crucial issues such as how international trade and migration, institutions and flows of physical and human capital impacted economic growth. 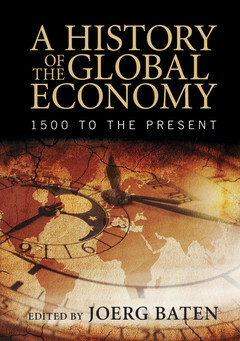 Richly illustrated with informative figures, maps, tables and charts, A History of the Global Economy summarises the key economic findings, debates and ideas, and provides students and the interested public with an up-to-date and engaging introduction to the origins and evolution of today's global economy. Introduction: a history of the global economy - the 'why' and the 'how' Joerg Baten; 1. North-Western Europe Jan Luiten van Zanden; Interlinking chapter 1. The great divergence in the world economy: long-run trends of real income Stephen Broadberry; Highlight article 1.1 International financial regulation and supervision Catherine Schenk; 2. Southern, Eastern and Central Europe Joerg Baten; Interlinking chapter 2. The Sputnik shock, the Pisa shock: human capital as a global growth determinant Joerg Baten; Highlight article 2.1 State finances during civil wars Pablo Martin Acena; Highlight article 2.2 Property rights in the Russian Empire Irina Potkina; 3. The United States and Canada Price Fishback; Interlinking chapter 3. The Great Depression of the 1930s and the world economic crisis after 2008 Kevin Hjortshøj O'Rourke; Highlight article 3.1 Multi-divisional firms and managerial capitalism Franco Amatori; Highlight article 3.2 Business history and innovation Knut Sogner; Highlight article 3.3 Alfred D. Chandler, Jr: the man behind modern business history Franco Amatori; 4. Latin America Luis Bértola and José Ocampo; Interlinking chapter 4. Was there a 'curse of natural resources'? Joerg Baten; Highlight article 4.1 Latin America, 1500–1800: early contact, epidemics and numeracy development Joerg Baten; Highlight article 4.2 The economic consequences of independence in Latin America Salomon Kalmanovitz; 5. Japan's long-run growth process in a Eurasian perspective Osamu Saito; Highlight article 5.1 Japanese industry during WWII Tetsuji Okazaki; 6. China Debin Ma; Highlight article 6.1 International expositions and East Asia's participation in the modern era Min Ma; Interlinking chapter 5/6. Trade and poverty, 1820–1913: when the Third World fell behind Jeffrey Williamson; 7. Middle East, North Africa and Central Asia Rima Ghanem and Joerg Baten; Interlinking chapter 7. Women in global economic history Sarah Carmichael, Selin Dilli and Auke Rijpma; Highlight article 7.1 The imperial expansion of the Ottoman Empire and its cultural determinants Rima Ghanem and Joerg Baten; 8. The economic history of South Asia: a survey of quantitative research Tirthankar Roy; Interlinking chapter 8. Human stature as a health indicator in colonial empires Joerg Baten and Kris Inwood; Highlight article 8.1 Did brain-drain from India cause underdevelopment? Numeracy of Indian migrants and the Indian population, seventeenth to twentieth century Joerg Baten; 9. Southeast Asia and Australia/New Zealand Martin Shanahan; Highlight article 9.1 Pre-history, ancient and classical periods of Southeast Asia Martin Shanahan; Interlinking chapter 9. Institutional development in world economic history Joerg Baten; 10. Sub-saharan Africa Gareth Austin; Highlight article 10.1 Why was Ethiopia not colonized during the late-nineteenth-century 'Scramble for Africa'? Marjolein't Hart; Conclusion Joerg Baten; Index. Joerg Baten served as Secretary General of the International Economic History Association and is still active in its Executive Committee. Recently, he was elected as president of the European Historical Economic Society. Baten created new research fields of numeracy development in long-term perspective and added a global perspective to studies on the biological stand of living (using height as indicator). He is the author of a number of articles in refereed journals. His publications include studies on all world regions.